While skincare manufacturers are using catchy taglines and marketing gimmicks to gloss over the often-questionable contents of cosmetics containers, at Biologi, we’re all about the education. Our brand promise is to help consumers learn about the ingredients in everything they put on, and therefore in, their skin so they can make informed choices about their products. Of course, it’s not a coincidence that you need a degree in skincare formulation to understand how to interpret an ingredients label! There are also many loopholes surrounding labelling which can make understanding ingredients a minefield. Here are our top tips on how to read the ingredients label and what to look out for. Taglines using ‘natural’ or ‘naturally-derived’ don’t necessarily conform to our traditional understanding of the word. While the TGA regulates labelling of ingredients and therapeutic claims, marketing of skincare packaging is largely unmonitored. This means manufacturers can use the word ‘natural’ or ‘pure’ and if it’s not the case, there is no consequence. It’s therefore up to you, and you alone, to cut through taglines and decipher the truth about the ingredients. ALWAYS refer to the specific ingredients listed rather than taglines or marketing claims. Remember that every single ingredient on the planet is derived from a natural source in some form. Even petrol once started as a natural ingredient. But would you put fuel in its current form on your skin and expose your body to toxins? And skincare should be no different. If something is derived from a natural source, it usually means it’s been watered down, laced with synthetics to keep it stable, and activating ingredients to make it work. Naturally derived generally means you’re putting a concoction of chemicals on your skin in the misguided belief you’re doing the right thing for your skin. ‘Derived from’ and ‘naturally-derived’ are terms that should always rouse suspicion if your focus is natural skincare. Active ingredients are natural ingredients which have been proven to change the structure of the skin on a cellular level. The higher the percentage activity on a product, the more the benefit to your skin. If a product sits at 2% activity (which is a general rule of thumb for skincare), the remaining 98% of the product is made up of synthetic stabilisers, activating agents and water. Or as we like to say, 98% ‘unnatural’. All Biologi serums are 100% active, but more about that later. Consumers often view water or aqua as hydrating and good for the skin. All water actually does, though, is make the product stretch further so manufacturers can charge less making it more consumer-friendly. Water also dilutes the activity of the natural plant extracts leaving the work to be done solely by synthetics. Vitamin C in skincare is liquid gold. With its anti-ageing, hydrating and anti-inflammatory properties, vitamin C is the go-to ingredient for many skincare connoisseurs. What ingredients labels are failing to make clear though is that vitamin C is notoriously unstable once extracted from its natural source. This is where ascorbic acid steps in, which is nothing more than a synthetic ingredient created entirely in a lab. The healing properties of natural vitamin C are contained in the molecule that must be destroyed to keep vitamin C stable. Due to our revolutionary extraction system, Biologi is the first, and so far, only, skincare product in the world that is a source of natural, stable, active vitamin C.
The ingredients in skincare products must be listed in order of quantity by volume or mass, apart from anything included under 1% which can be listed in any order. While ingredients must be labelled on the bottle (and in most cases, there’s not a lot of room on a container to read ingredients clearly), consumer regulations don’t require that the percentage of the ingredient is listed. Those that sit at the top of the list are in the higher quantity, but the amount may be unknown. Often, the best you can do is make sure that known irritants aren’t listed near the top. Ammonia, fragrance, clove, lavender, papaya, lemon, menthol, mint, papaya, witch hazel, rosehip oil, yiang yiang, cinnamon, essential oil, eucalyptus, peppermint and sand oil. Since parabens became a dirty word in Australia, paraben-free skincare is on the rise. Unfortunately, what the manufacturers don’t tell us is what they’re replacing parabens with. 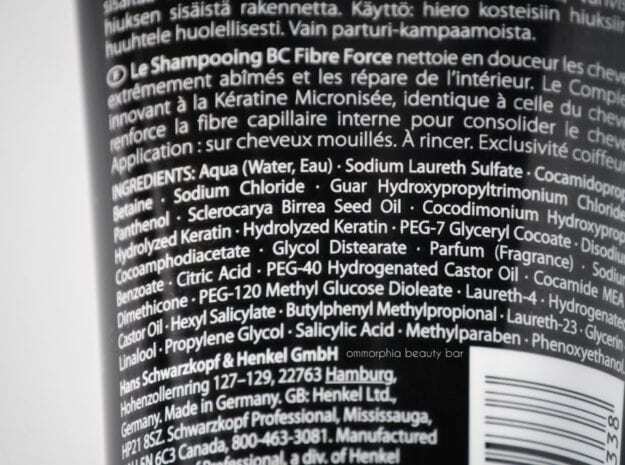 Benzyl alcohol and polyaminopropyl biguanide are common ingredients used to replace parabens as a preservative…and they’re as nasty for the skin as they sound. Toners, cleansers and moisturisers filled with alcohol and some acids also dry out the skin, damage the dermal layer and interrupt the skin’s natural hydrating processes. Look for ingredients such as Cetearyl alcohol, stearic acid, cetyl alcohol, ethanol, phenoxyethanol and acrylates which are common synthetic irritants. Read more about the damage they can do your skin and our overall health here. Fragrance or perfume/parfum is highly irritating to the skin. We recommend that if you have a sensitised skin type, you avoid it. Even natural fragrance such as essential oils can irritate delicate cells causing pain and discomfort. Fragrances are often made up of a myriad of toxin synthetics, but because ‘fragrance’ or ‘parfum’ is considered the main ingredient, there’s no law requiring the fragrance ingredients are listed on your bottle. Biologi is the first and so far, only single-plant ingredient 100% active skincare product on the market. We offer full transparency to our customers and followers and believe that everyone should understand the ingredients in their skincare to help them make informed choices.